Marcus Rashford is a doubt for England's Euro 2020 qualifier against the Czech Republic after training separately from the rest of the squad. 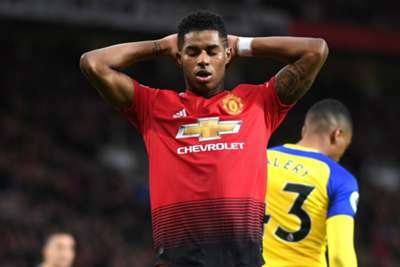 The Manchester United forward was unable to take part in full training because of an ankle injury, which he sustained against Liverpool last month. Despite the problem, Rashford has continued to play for United, but appears doubtful to feature on Friday at Wembley as England begin their Group A campaign. Following the game with the Czech Republic, England travel to Podgorica to face Montenegro on Monday. Rashford has scored two goals in his past three games for United, including the decisive penalty in their Champions League comeback against Paris Saint-Germain. The 21-year-old has six England goals in his career and scored twice during the group stages of the UEFA Nations League.